Well, all I can say is that week 20 definitely started in fine style, with 8 fish landed on Sunday, 5 on Monday and 4 by lunch today. Water conditions were excellent with the river running at 75, so fish had no problem running. First off the mark on Sunday was Leigh Hookes, (one of John Tappin’s party). 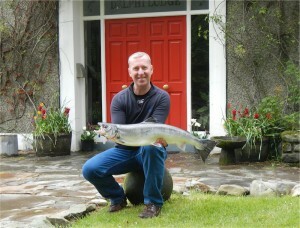 Leigh had a sea liced fish of 7lbs11ozs off the Waterfall pool on a Monkey Dog. He also landed two other off Finlough in the afternoon of 6lbs15ozs and 7lbs2ozs on an Executioner and a Green Peter muddler. Ronan Murphy had two off Doolough, one of 8lbs12.5ozs and and one of approx.13lbs. 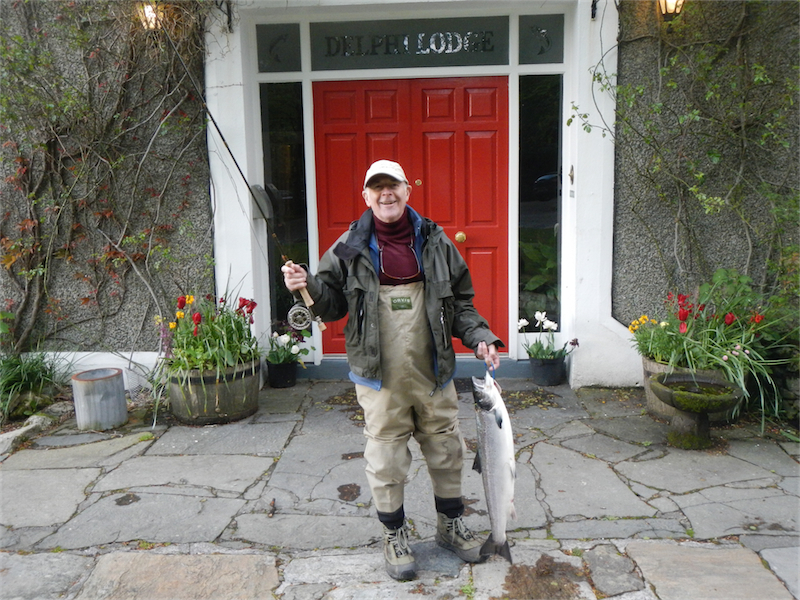 Paul Shalvey also had two, including a cracking fish of 11lbs5.5ozs off Finlough and the second of 6lbs off Doolough. Finally but by no means least Peter Milne had a fish of 9lbs7ozs on a Clartet shrimp, off Finlough. Ciaran Boland was first on the score sheet yesterday with three landed, one off the Waterfall of approx. 8.5lbs and the second of 6lbs7ozs off the Meadow. Both fish took a Willie Gunn tube. His third fish was off Finlough on a Delphi Collie and weighed in at 7lbs2ozs. Chris Jarman then had his second fish of the week off Doolough of 8lbs11ozs. Finally Chris Wathen had a magnificent fish of approx. 13.5lbs off Finlough on a Cascade. This morning we have 3 off the river and 1 off Doolough. Chris Jarman had two off the river, one from the Waterfall of 6lbs11.5ozs on a Collie Dog and one off the Rock pool of 10lbs2ozs on a Delphi Collie. Ronan Murphy also had a fish from the Rock pool of 9lbs7ozs on a Sunrae Shadow. Finally Paul Shalvey had another fish off Doolough of approx. 8.5lbs.